It turns out that in addition to excellent visual acuity, jumping spiders use a previously unknown method of determining depth. The trick that humans use to judge depth is using image offset coming from each eye to then estimate depth through parallax. Fusion of the imagery occurs in the brain with the percept of seeing a single image despite two separate images being transmitted to the brain. Other animals use parallax in a different way by moving their heads to estimate distance to objects of interest. I used to have a pet octopus that would range by parallax, bobbing her head up and down before reaching out for a Lego piece, crab or carp that I would put in her tank. It was absolutely fascinating to watch. Jumping spiders however, use an entirely different means of estimating distances that relies on spectral perception in the multi laminar principal eyes. They have 8 eyes total with the two large front facing eyes you can see in the image above being the principal eyes who’s “retinas” are organized into 4 separate photoreceptor layers, each receptive to different parts of the spectrum. The first two layers of the retinas are rod shaped and appear to be tuned to what humans perceive as the visible spectrum, particularly green light. However, its the first layer that the optics appear to focus the light on with the second layer receiving defocused light. Layers three and four are most receptive to ultraviolet light, but its the first two layers that are the subject of this paper. Image Credit: Bryan William Jones, Ph.D. Image originally appeared in a post here. 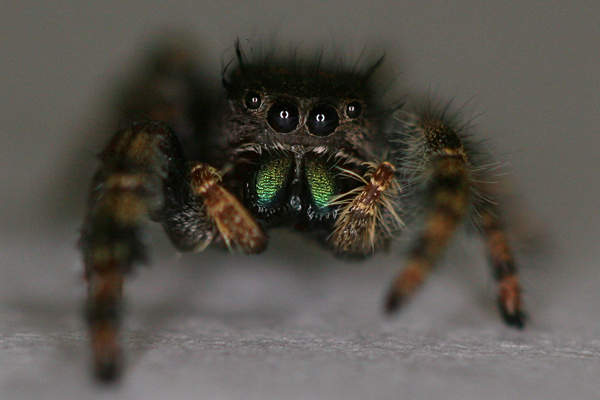 For some truly amazing imagery of jumping spiders (and other insects), see Thomas Shahan’s image stream on Flicker. I am a big fan of Thomas Shahan’s work and eagerly look forward to the next, greatest image from him.